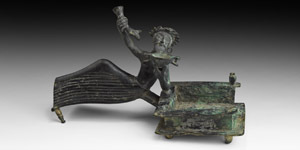 A bronze figure of a male enjoying a symposion, a festive celebration, reclining on a couch with feasting tableware; the figure bearded, sporting earrings and a wreath of laurel(?) leaves to the brow, bare-chested and with a mantle covering the legs, with one leg raised; right arm raised holding a ram's head rhyton, left arm supporting his weight, holding a skyphos beneath the chin by two extended fingers; elbow resting on a ball cushion attached to the rim of an open rectangular scoop with its base supported on stub feet and one baluster remaining to one end. 1.6 kg, 25cm (10"). Very fine condition. Property of a central London gallery; acquired on the North American art market 1990s; formerly in a private collection formed 1960s. See Garnsey, P. Food and Society in Classical Antiquity, Cambridge, 1999 for discussion of Greek and Roman feasting customs. The Greek συμπόσιον 'symposion' was the later part of a formal banquet which took place after the food had been consumed, when the serving of strong drink was accompanied by music, dancing, poetic composition or recital or earnest conversation. The custom has correspondences with the Roman convivium and with the customs of many Mediterranean and western Asiatic peoples. The Parthian Empire was culturally diverse and included many Hellenic groups; the Arsacid court adopted a range of aspects of contemporary Greek culture, among them Greek military structures and the Greek language as a lingua franca alongside the Parthian (Iranian) language and Aramaic.